If you live outside the area, or are new to Saham Toney and want to find out more about it, this is the place to do that. Saham Toney is a village and a civil parish in the county of Norfolk, Breckland District (see Map below). The parish comprises not only the village of Saham Toney, but also Saham Hills, which has its own distinct history and character, together with a number of small hamlets, including Saham Waite. The majority of land in the parish is open farmland or parkland. 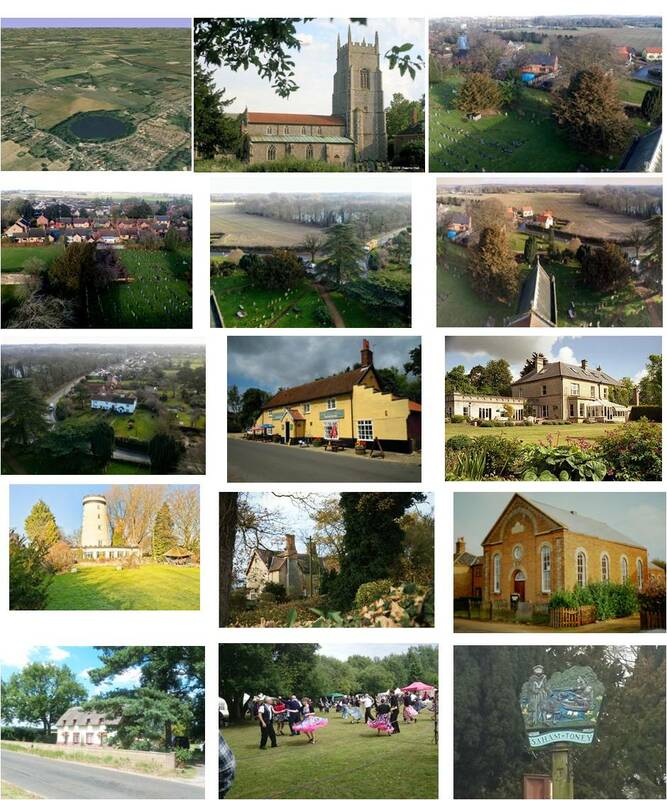 Photographs showing general views of the neighbourhood area are given below. The village of Saham Toney derives the first part of its name from the old English meaning "village by the lake", referring to Saham Mere, a 12 acre body of water dating back at least 12,000 years. The second part of the village's name derives from the fact that the land was owned by Roger de Toney, a descendant of William the Conqueror's standard-bearer, who was awarded the Capital Manor in Saham by King John in 1199. The layout of dwellings generally follows the roads, mainly in the central area around the Mere, and radiating outwards towards Watton to the south, Swaffham and Dereham to the north, Cressingham to the west and Ovington to the east. For most of the parish's history housing was set out in a ribbon pattern in single lines of development with a few small clusters of up to about 30 houses each added over time since around 1970. Saham Toney has a significantly higher proportion of older adults than Breckland, Norfolk, the East of England or England as a whole. It has correspondingly fewer young adults and children. It also has a considerably higher proportion of larger, owner-occupied homes than those 3 comparison areas. Saham Toney relies substantially on local and regional facilities, with neighbouring Watton being of particular importance, providing a medical practice, dental practice and veterinary facilities, pharmacies, banks, a supermarket, food and general stores, post office, newsagents, garages, restaurants, other retail outlets, a library, sports and social facilities, and a weekly market. Watton also provides secondary education although not for sixth formers, who must travel elsewhere in Norfolk. Access to Watton is reasonable for car owners, but less so for those who rely on public transport, while there is only one paved route for pedestrians (along most of Richmond Road, mostly only on the east side of that road). Further afield Dereham, Swaffham, Thetford offer a wider range of services and facilities. The nearest rail services are at Thetford, Downham Market, Brandon, Attleborough, King's Lynn, Diss, Wymondham or Norwich. Major hospitals within the region are available only in Norwich, Kings Lynn or Cambridge. Both the parish and village of Saham Toney have a distinctly rural character, which in part at least determines the social character of the area. It has a gently undulating land form, tributary streams, arable and pasture farmland and small blocks of farm woodland. The land immediately surrounding the village is predominantly pasture, enclosed by hedgerows with some areas of wet woodland, including the willow and poplar vegetation fringing Saham Mere. The south-west area is an enclosed parkland landscape of pasture, small woodland blocks, and tree lined watercourses. To the north and both east and west the landscape is more typically an open arable landscape forming the transition with a higher plateau landscape. The Neighbourhood Area has a range of building styles, layouts, densities and materials, resulting from its gradual development over many centuries. This makes it somewhat difficult to define particular characteristics as typical, but nevertheless different parts of the Area have distinct forms that are worthy of preserving. Saham Toney has a long history of settlement. Archaeology UK’s ARCHI database identifies more than 400 sites of registered archaeological interest within ten kilometres of Saham Toney. 152 of these lie within the parish of Saham Toney itself (Source: Norfolk Heritage Explorer records), including the site of a Roman camp at Woodcock Hall, an Iron Age settlement site, a cemetery and other sites from Anglo-Saxon times, and the site of a monastery at Saham Hills. There is considerable wildlife in the neighbourhood area and its landscape in general provides a habitat for some rare and threatened species. The parish is a major contributor to the Wayland “Growing Together” project and this has led to the creation of an area of wild meadow directly adjacent to the children’s play area and the Community Centre. A community orchard is planned on part of the village sports field. But generally there is limited open space for public use. Various parts of the Neighbourhood Area regularly experience local flooding. A variety of factors contribute to this: the relatively high level of the water table in the area; the inability of underground drainage pipes to cope when rainfall is prolonged and/or intense; reliance on drainage ditches that are poorly maintained, overflowing water courses; run-off from land higher in the catchment area, and increases in hard paved areas not accompanied by drainage system improvements.